The year 2008 marks the beginning of the baby boomer retirement avalanche just as the different demographics in advanced and most developing countries are becoming more pronounced. People are worrying again that developments in global population trends, food supply, natural resource availability and climate change raise the question as to whether Malthus was right after all. 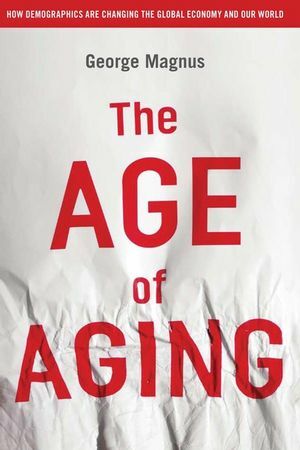 The Age of Aging explores a unique phenomenon for mankind and, therefore, one that takes us into uncharted territory. Low birth rates and rising life expectancy are leading to rapid aging and a stagnation or fall in the number of people of working age in Western societies. Japan is in pole position but will be joined soon by other Western countries, and some emerging markets including China. The book examines the economic effects of aging, the main proposals for addressing the implications, and how aging societies will affect family and social structures, and the type of environment in which the baby-boomers' children will grow up. The contrast between the expected old age bulge in Western nations and the youth bulge in developing countries has important implications for globalization, and for immigration in Western countries - two topics already characterized by rising discontent or opposition. But we have to find ways of making both globalization and immigration work for all, for fear that failure may lead us down much darker paths. Aging also brings new challenges for the world to address in two sensitive areas, the politicization of religion and the management of international security. Governments and global institutions will have to take greater responsibilities to ensure that public policy responses are appropriate and measured. The challenges arising within aging societies, and the demographic contrasts between Western and developing countries make for a fractious world - one that is line with the much-debated 'decline of the West'. The book doesn't flinch from recognizing the ways in which this could become more visible, but also asserts that we can address demographic change effectively if governments and strengthened international institutions are permitted a larger role in managing change. George Magnus is the senior economic adviser at UBS Investment Bank and has held this position since 2005. Before this, he was the bank’s chief economist with effect from the merger between UBS and Swiss Bank Corporation in 1998, leading a team of professional economists to the highest accolades in the Institutional Investor and other industry analyst surveys. His previous responsibilities involved senior macroeconomic and managerial positions in Union Bank of Switzerland, SG Warburg and Bank of America. Mr. Magnus’ research is widely known and respected in the financial services community and the business media in the United States, Asia and Europe. He was one of very few to articulate at the beginning of 2007 that a major credit crunch in the United States and the West was likely, with damaging and long-lasting economic consequences around the world. He lives and works in London, is married, and has four children. Population take-off, Malthus, and Marx. Chapter 4: The economics of aging—what is tobe done? More self-reliance for retirement savings. Age-related spending in OECD countries. America’s healthcare and public spending explosion. Prime-age house buyers in decline:who will buy? Middle East and NorthAfrica—rage, religion, and reform. Globalization and well-being: the case of HIV/AIDS. Short-run effects positive but may not last. The secular-religious pendulum swings back.